For additional timely articles and photos be sure to check out our Facebook page! 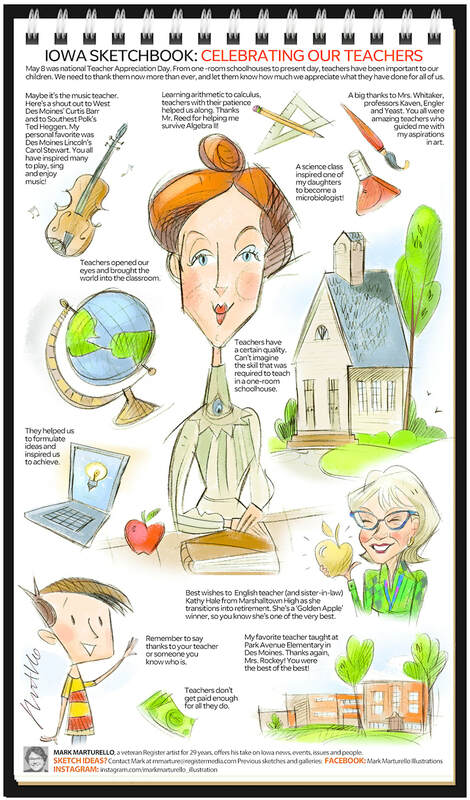 CSAA board member Bill Sherman was enjoying his Sunday morning Des Moines Register when he spied the Iowa Sketchbook subject he'd been waiting for... "Celebrating Our Teachers!" Artist Mark Maturello made Bill's day creating his work to celebrate National Teacher Appreciation Day on May 8th. Even more gratifying was that Mark chose to feature a one-room schoolhouse and cite the skills necessary to teach in one. Bill wrote to Mark immediately for permission to share this cartoon sketchbook with CSAA readers and learn of Mark's motivation for the piece. Mark responded right away saying he'd been, "thinking a lot about teachers this year," and that said he was, "effected by the shootings that have taken place in schools that seem to be so commonplace today." He shared a number of reflections on why he added certain elements. "With the school year near its end, I thought it was a good time to thank teachers past and present for making a difference in our lives. Teachers are a rare breed that do wonders with shaping the future. And most obviously, they are underpaid and under appreciated." "I wanted people to look at the sketch and think about their teachers or maybe their children's teachers that have truly inspired. I hope the sketch encouraged people to think about thanking their teachers or maybe someone they know who is one." He continued, "I linked the one-room school into the sketch to convey that this profession has been around for such a long time. I guess I couldn't have imagined how it would be to teach multiple grades under one roof." Mark graciously shared how he goes about the process. "When I create a sketchbook, I typically go out and take pictures of the event, writing down names and basic commentary of the situation. I will later upload my photos to my computer so I can do a sketch while looking at the computer monitor. When I first started doing the sketchbook four years ago, I had people pose at the event as I drew them. It worked fairly well, but people today are in such a hurry and some folks that I wanted to include couldn't stay around so that's when I ended up taking pictures of them on my phone." Not counting driving time, Mark says it takes him about 11-12 hours on average to complete a sketchbook: taking photos, uploading to his desktop, doing the first sketch, tracing sketches with vellum, scanning sketches, designing each page and moving sketches around until he gets a pleasing design, writing the basic information for each sketch, laying down color using Photoshop with different brushes to finish the sketch, and proofing the sketch making color adjustments and text placement. CSAA thanks Mark Maturello sincerely for allowing us to reprint his Sketchbook and for sharing information on his process. We know our readers will enjoy his artwork! Thanks also to the Des Moines Register!